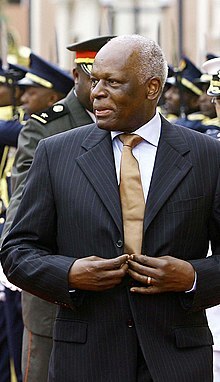 José Eduardo dos Santos (born August 28, 1942) is an Angolan politician. From 1979 until 2017, he was the President of Angola. As President, dos Santos was also the commander in chief of the Angolan Armed Forces. After leaving the presidency, dos Santos remained leader of the People’s Movement for the Liberation of Angola (MPLA). ↑ Kazeem, Yomi (August 22, 2017). "Africa's second longest serving leader is stepping down". Quartz Media. Retrieved 1 October 2017.